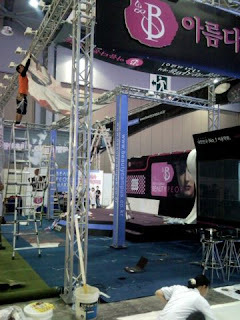 So for this weekend, more report on my last trip...(BEAUDEX)Global Beauty Design Expo in Korea.. I've read some incorrect reports on the event, thus after verifying with the Korean Competition Committee for this event, this would be a more accurate aftermath report. The event was a huge success in unifying all 5 Nails Association in Korea to come together for the first time organizing Korea's 1st Nation-Wide Nail Competition. A Judging Committee was form to decide on the details of this competition. Head Judge was Ms Kim Mi Won(Korea Nail Expert Association), her many experiences Judging in various Europe & Asia Nail Competitions is useful in bringing their 1st National Nail Competition to the same international platform. 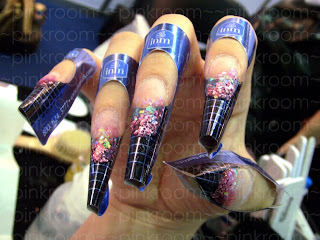 She was assisted by 5 Chief Judges, each representing a Nail Association. The Judging Committee also includes representatives from the Korean Government. All decisions were made during the numerous committee meetings held prior to the actual competition day. Each Association were also to submit 30 judges to make up the judging team for the 2000+ strong participating entries. There would be a total of about 150 Judges in all for competition day judging.The judging committee also decided to have a MASTERS CATEGORY for the top nail professionals in Korea to compete on.Masters Category participants are to complete 1 set of French Sculpture and 1 set of Design Sculpture in 150 minutes. The Judging Committee also decided to invite international judges to assist in this Masters Category of the competition; each Nail Association was to submit 2 Judges for the Master Category Judging, one Korean Judge and one foreigner Judge. It was decided that the 5 International Judges for the Master Category to be: Danny Haile, Carla Collier(Nailpro Head Judge), Trang Nguyen, Fiona Chua(Hong Kong Nailist Union) and Rachel Tang(myself). 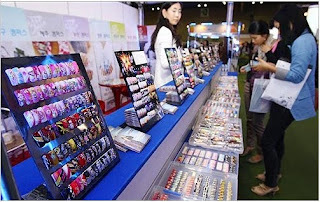 Unfortunately, weeks before the competition day, one of the association - Korea Nail Association (KNA) requested that they be allowed to invite a 3rd Judge for the Master Category instead of the agreed 2 Judges agreed upon for each Association. 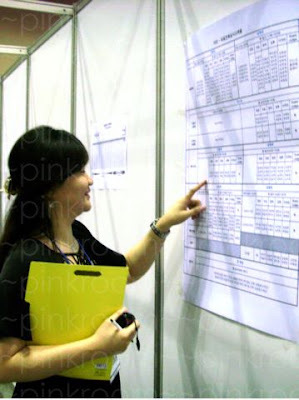 As the additional Judge they requested to be invited, happened to be on the same Competition Team as Trang Nguyen(one of the 5 International Judge); the Korea Judging Committee deemed it would compromise the fairness of the Master Category Judging. Thus they refuse for the 3rd Judge to be included as a Master Category Judge. As with any differences in opinion, numerous meetings & discussions were held to try to reach a amicable solution; after which the final decision of all committee members(including the government representatives) was to cancel the competition of the Master Division. The 15 participants from the Master Category would proceed to showcase their work during the competition, but there would not be any judging of this category. This decision was made in unison during the Judge Committee meeting weeks before the Competition Day. It was not a last minute decision and all Master Category participants were informed. The Judges were to be informed by the Association that invited them. Well... I was informed... Thank God, else it would be embarrassing if I went to Korea still thinking that I am a Masters Category Judge right? ... shiver ... But anyway, I was there not only to Judge the Master Category, there are also many other categories to judge too.Of the 15 participants in the Master Category, 9 participants are from the Korea Nail Expert Association. I'm not affected much by their decisions though, coz IT IS after all a Korean National Competition... I'm just an foreigner, I need to respect whatever decisions they decide. I felt that non-Koreans dun really have a right to intervene in their country's 1st unify efforts to run their own National Competition. 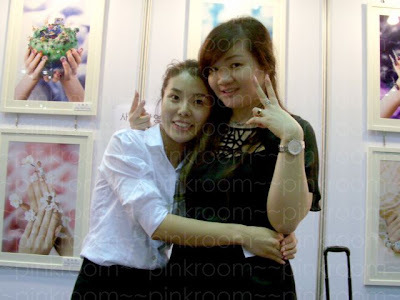 Korea had become like a second home to me, with me going to Korea nearly every month for a Nail Event or Seminar. Being one of the few international individual to be involved in the coming together of all Korean nail associations holds a special meaning for me... for I know that real unity is actually such a hard thing to bring to reality, but Korea had taken its first step. All in all, it was a good competition.. But more importantly a special opportunity for all 5 Korean Nail Associations to get to know each other through this event. Hopefully draw closer and make build more bridges between each other. 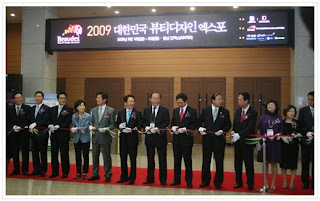 For now, it is impossible for Korea to become one big association as all individual associations have their own uniqueness, but after this event, I think it is possible for the 5 Nail Associations to work together as One Big Family of Associations. Korea's 1st National Nail Compeition Opens!! Check out the seating map, reminded me of the Japan License Examinations where there are thousands. Here's me checking out my judging time slots. Today is also the start of the nail service charity drive for World Vision. Customers need to make bookings and can choose from a menu of 7 types of nail designs ranging from 20,000Won to 37,000Won. Of course everyone is encouraged to give more, all service money collected goes to World Vision. I contributed to the pot too!! There was an empty slot before closing, thus did a set of design sculpture! I mean every gal could have spend their weekend shopping or working in their salons. Earning money for their own pockets.. I see everyone rushing up and down looking for nail polish bottles, using their strength filing hard at those nail extensions without complaining..
Maybe I'm too used to seeing so many in the industry aiming at fame,power & money, more power and money & admiration for their nail skills or "achievements"... it's touching to do nails for no returns except the fact of knowing that it can change a kid's future thru this action.. quite cool hur? You'll need to be doing this action to feel what I felt..haha. Would share how much we managed to raised.. It had been a while since my last post. We were so busy at the academy for the past months. 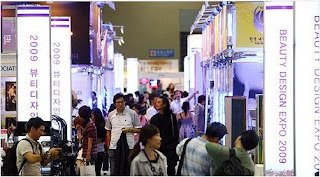 Just completing our show at Bugis Junction, we are preparing for the "Big Bang" end of this month. I'm presently in Korea now... Invited as the International Judge for Korea's first National Nail Competition!! The rest of the Judges are Korean who represents each nail association involved in the event. Thus, it's so exciting to be part of this pivoting point of Korea's Nail Industry. Our 2009 Nail Art Book Gallery Charity Event. This year's Nail Art Gallery is done in collaboration with World Vision . It makes it more special as we would be donating the money that we raised for this event to World Visiontowards their goal in "Building a better world for children". For those who have no idea what World Vision is about, perhaps you would have remember some stars like kit chan, Ah-Mei, etc. visiting their sponsored child in countries like Africa,etc. Or the "30hour Famine".. It's a fasting activity aimed to raise awareness of world hunger through real-experience of being hungry. READ A-MEI’S BLOG --> A-Mei, the newly appointed 30 HOUR FAMINE Ambassador for World Vision Singapore and Malaysia, travelled to India recently to meet the children and their families in a move to better understand their struggles surrounding the food insecurity and HIV/AIDS issues. Besides the Nail Art Gallery, we would also be compiling all the Nail Art Photos into a book, which would be up for sales in November 2009. Tomorrow, we would be providing nail services at discounted rates; all money collected goes to World Vision too. It makes it more meaningful when the work that I do can create change in the world. That doing a simple thing like nails, would come to this day where our skills can make a difference. It is something to just sell a nail book, which everyone seems to be able to do nowadays; but another thing to be able to raise donations with it. My experience with World Vision started during my school days, I sponsored 2 kids from their "Sponsor a Child" program. "As a child sponsor, you are connected with one special child who will know your name, write to you and feel your tender love and prayers. Your child sponsorship monthly pledge of $30 will provide a child with things such as: Clean Water, Nutritious Food, Health Care, Educational Opportunities, Spiritual Nurture." Of course seeing your own work displayed and admired is also a fulfilling experience. We should do a Nail Art Gallery like this in Singapore or Malaysia soon hur?